In this passage, David moves the neglected ark to his new capital in order to place God back into the center of communal life. However, the same move is a shrewd consolidation of his own political power. David has conquered a city that was not part of any tribe; Jerusalem can literally be termed the “city of David.” Why does he want to move it? His initial motive is not given, but, positioned after the events narrated in chapter five, one can wonder whether David is adding to the luster of his city. 2 Samuel 6 begins with an impressive number of people (30,000 men). This finalizes the move to kingship. At this point this becomes a permanent, established dynasty. The joining together of the Northern and Southern Kingdoms is magnified by the number of people present. The allegiance to Saul is over and all are united around David. David, of course, is never perfect but is God’s choice. 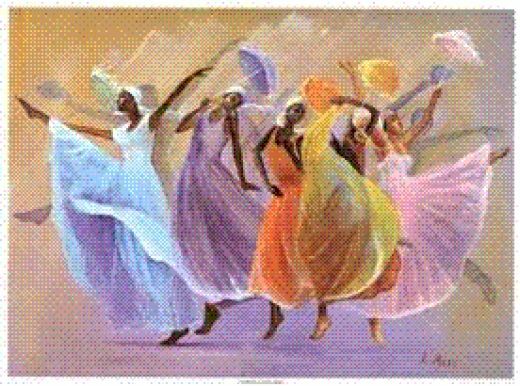 And so, he donned an ephod and he danced…they danced with all their might. They placed the ark, the center of worship where it belonged, made offerings, distributed food, and celebrated. The ark had been returned after being captured by the Philistines. It was now the center of the community, the center of shared life. The ark, the container for the commandments that had accompanied the people as they wandered in the wilderness, was a “visible symbol of God’s awesome and never-ending Presence.” But under King Saul, the Ark was not in place. It had been gone for about 30 years. David brought it back. And it was something to celebrate! And the worship showed this—there was dancing with everything they had. The ark was back. God was here! And then they shared a meal together before going to their homes. You know, you can say what you want about David and about all of his shortcomings, but he knows how to worship! There was nothing reserved. This was a pure, unadulterated expression of joy in what God has done and what God is doing. It’s hard for us to get there, but, when you think about it, isn’t that what worship should be? Nineteenth century Christian philosopher Soren Kierkegaard developed an analogy called the “theater of worship”. Now I know that sends all kinds of red flags up for us. After all, we take real exception to anything in worship being deemed a performance. But Kierkegaard takes it a step further. So, think about your answer to three questions. First, when you think about worship, when you think about the place of worship, when you imagine sitting in the sanctuary, where is the stage? Second, who are the actors? And, third, who is the audience? Well, most people will say that the stage is the chancel—the altar, the pulpit, the cross. And most will then answer that the actors in the theater are the ministers, the musicians, the liturgists. So, of course, the audience is the congregation—all of those who came to worship. But, that’s not what Kierkegaard said at all. His answers? The stage is the whole house of worship. If you really think about what worship actually is, it is the whole house of God, so I would contend that the stage is everything beyond these walls too, the whole of Creation. And the actors are the ministers, and the musicians, and the liturgists. They are also the congregation. Every one of us, every child of God, is an actor in this theater of worship. So, then, who is left to be the audience? God…God is the audience. God is the one we worship. I’ve always loved that. I think it puts it in real perspective. Our worship is not for us. It is not penitence or requirement. It is certainly not therapy or a way to get our lives back on track. The expectation for our worship is not limited to what we get out of it. Worship is the work of all the faithful who gather to praise, honor, and glorify God. It is reflection on what God has done and response to what God is doing. In worship, we somehow, some way, enter the mystery that is God. Worship, whether literally or figuratively, is a dance with the Divine. So, how passionate is our worship? How prepared for worship are we when we come before God? How filled are we with awe for the God of us all? How deep is our joy for what God has done and what God is doing? What expectations do we bring to our worship? Are we hoping to leave feeling good or comforted? Are we expecting to find God? Sure, sometimes we get that. But that’s not what it’s about. Worship is more than sitting in the pew and hoping that God will somehow visit us this day. Worship is transcendence. It is about opening ourselves up to something that is beyond our imaginations and certainly beyond our control. Worship is not the place where God comes to us. That is actually the rest of our life. Rather, worship is the place where we go to God, where we stand in awe of our Creator, of the things that God has done, and begin to move. With fear and trembling, we let our feet move to a different beat, and find ourselves in celebration and praise, dancing with all our might. Angela Monet said that “those who danced were thought to be quite insane by those who could not hear the music.” It sort of makes you look at David’s Ephod Dance differently, doesn’t it? What does this tell you about worship? How do most people in our world view worship? In what ways are we called to dance? What stands in our way? In the Greek, this is one sentence! Perhaps the writer (probably not Paul but rather a student or disciple of Paul) did not have Mrs. Roberts for Freshman English! The blessing speaks of Christ as an expanding sphere of influence or power, intent on filling the whole universe. This gives shape to its understanding of mission. The earth shall be filled with God’s goodness. But this Scripture can also lead to mistakenly understanding the church as an entity that is meant to take over everything – a kind of imperialism. Sometimes the focus appears to be on renewal and positive transformation which will be good for people. Sometimes one has the impression that it is all about subordination and absorption. But the heavenly and spiritual space appears not to be a far away place but a dimension of existence in the here and now as we participate in this life. The goal is relationship and is meant inclusively. It is meant for all. The benefit appears as redemption, deliverance, and forgiveness of sins. But limiting it to that is really a narrowing of the idea. Here the mystery is about God’s plan to bring oneness. It is all encompassing with Christ filling all things. The author’s focus shifts immediately to ‘you’. He means his Gentile readers. What was once generally applied to those deemed as “chosen”, the religious, the “church”, this sense of being chosen, of being redeemed and forgiven, of being informed about the divine plan for the world, is now being applied to those once excluded. No one has a private claim on the Spirit. This passage, then, can enable us to see ourselves, our world and our place in it in ways that are part of the whole tradition. We are adopted. We need to realize that there was no concept of “adoption” in the Old Testament. The word “adoption” wasn’t even used in the Old Testament because the Jews didn’t practice it; adoption wasn’t part of their mindset. Nor was the word or concept in the mind of Jesus who was a Jew. Nor is the concept of adoption found in the first four gospels. But for the Apostle Paul, adoption was part of his Roman world and adoption was used at least five times by Paul. You need to understand Roman law to understand adoption. For example, girls weren’t adopted under Roman law. It was part of Roman law that only sons inherited property. The Roman Caesars’ adopted sons frequently in order to give them their grand inheritance, and the focus was on the Caesar who chose a son to be adopted. In adoption, it was the will of the Caesar that was important; not the will of the son. The Romans practiced “patre potentus,” (the patre = father; potentus = potent). Adoption presupposed a potent father. All legal rights were with the father and none with the son. It was the father’s will which controlled everything. The concept of adoption was pleasureful, a source of happiness and joy as the Caesar designated his adopted son to be his designated heir and receive a grand inheritance. It is the pleasureful will of the Caesar that is important; not the will of the adopted person. So, in similar terms, our adoption, then, is the will of God; it is sacramental. God has adopted us. It is already a part of us. What does this image of “adoption” mean to you? What does the concept of inclusiveness mean as it relates to adoption? Now you will recall that back in Chapter 1 of The Gospel According to Mark that we read during Advent, we were told that John the Baptizer had been arrested. We then hear no more from or about John until this passage. Now most of this account is told as a flashback, which is actually a sort of rarity for Scripture. Here, the Gospel writer throws the announcement down in front of us: John the Baptist, that odd camel-hair wearing, locust-eating, wilderness-wanderer who preached repentance and change and pointed to the light of Christ was dead, viciously beheaded by the powers that be. And then we hear the account of how and why that came about. It’s an odd story, almost fable-like. Herod Antipas has had John arrested because he had denounced Herod for putting aside his legitimate wife and marrying the wife of his brother. (Whoever told us that soap operas were a modern invention?) And yet, on some level, Herod found John fascinating, maybe even respected what he had to say and yearned to hear more, although he definitely thought it was disturbing and confusing. But he certainly did not wish him dead. But this was not the case with Herod’s wife. So, in order to accommodate his wife’s wrath, he has John arrested. And then Herod throws himself a birthday party, a big to-do with lots of good food, good wine, and dancing. And the entertainment for the evening was provided by the young, beautiful, dancing daughter of Herod’s new (and John had contended illegitimate) wife. Well Herod was so pleased with her performance that he promises her anything. The world was hers. So the young girl runs to her mother just outside the room. Here was Herodias’ chance. Her nemesis John would meet his demise and she would be rid of him. And so the young girl returns to the party and makes the fateful request for John the Baptist’s head on a platter. Herod must have nearly choked. This was not what he wanted! His vengeful wife and this spoiled child had crossed the line. He knows that no matter who John is, he does not deserve death. But, as the governor he was in what he construed as a tenuous position at best. After all, he had made a promise and had voiced it in front of numerous witnesses. If he didn’t follow through with it, no one would trust him again. So to save face and to secure the balance of power, he complied. After all, he was governor. Some things have to be done for the good of society and for the preservation of the way things are. Our tendency is to more or less excuse poor, pitiful Herod. After all, he almost couldn’t help it, right? He was married to a spiteful wife with a spoiled daughter. And he had to be under a lot of pressure as governor. After all, things were really not going that well. He had to show people that he was still in control or the whole society would fall apart. We almost feel sorry for him, but, in the end, he still gives the order and takes the easy way out. He still has to take responsibility for what he’s done. So what does this have to do with us? Why is this passage even included in the Gospel in the first place? What exactly are we supposed to glean from a story that is so violent and so gory and seemingly so totally out of time and place? Commentators have always pointed out the parallels between John’s death and Jesus’ Crucifixion and thought that perhaps this was the writer’s way of foreshadowing what was to come later in the Gospel. But if that was the only reason that this was included, it would be easy for us to remove ourselves from it altogether. Perhaps we’re also meant to look on this as a reminder, a call to witness, if you will, of who we are and who Jesus calls us to be. Because we can say what we want to say about Herod; we can point to his weakness, to his need to appear in control, and to his fear of who John the Baptist really was and what John’s words meant in his life. The passage tells us that Herod feared John because he was righteous and holy. In other words, he revered him enough to know that on some level John was right and that John’s words meant that Herod would have to change his life. But this is not just an historical account about Herod. I really do think that somewhere in this passage, we are meant to find and look at ourselves and our own lives. Because we, too, make our own concessions—not to the point, obviously, of ordering someone’s death but in our own way we also bow to convenience and convention. On some level we all live our lives wanting to be victorious and successful, wanting people to like us, and, like Herod, we sometimes miss the opportunity to do the right thing. We close our ears and our minds and we leave, hoping the whole messy thing will just go away. And we miss the opportunity to be who God is calling us to be. Maybe that is the reason that this horrible story is here in the first place; otherwise, we’d all be tempted to start thinking that this Christian walk involves following some sort of miracle working-healing-rock star-Superman character. Well, sign us all up for that! But it’s not about that. Jesus kept telling everyone not to say anything about all those miracles because following Christ does not mean going where the miracles are; it means becoming Christ-like. It means becoming holy. Think about it. The disciples are riding high on the power of Jesus’ teaching and miracles. And Jesus sends them out. In last week’s Gospel passage, Jesus actually told them to expect rejection. But just in case we missed that part, it is made much more explicit today…This is not easy. But easy is not what we were promised. This story of John the Baptist calls us to have the courage to be truth tellers, to tell the truth that is God to everyone around us and to stand up for what is right, to speak out against injustices, and to boldly and with all our might dance to the music that God is playing for us. We have a tendency, though, to play it safe, keep our mouths shut, and work hard to avoid offending anyone or doing anything that might disturb the peace of our carefully-choreographed lives and our cautiously thought-out religion. And, yes, speaking out may sometimes be uncomfortable; it may not win us any popularity contests; it may even mean that we are in many ways rejected from what we think is a normal way of being. If we take the Gospel seriously, it means that we may no longer relax in our comfortable cheap seats and look for God to show up on cue but rather that we will have the courage to become holiness. What does it mean for you to “stand up” for your beliefs, for the right thing? Do you have other ideas as to why this account is included? What does it mean for you to approach holiness? Dancing God, passionate leap of creative energy skipping among the stars, waltzing on rivers, birthing a universe. Dancing God, tumbling from somewhere into Jewish territory, whirling Spirit seeding Mary’s womb with alluring divinity. Dancing God, uncontainable grandeur, kicking and rolling in Mary’s flesh while untamed cousin echoes the dance in Aunt Elizabeth. Dancing God, spark of angel’s song, shepherds hurrying like whirling dervishes gasping in awe at a surprising child. Dancing God, still passionate today, dynamic movement of love wooing our hearts toward oneness and peace in a tear-stained world. Dance on, Passionate God, we are your dance now. Teach us the tune, show us the steps. It is time to dance.